This is Our First Tutorial From Classic IC Circuit Diagram Series. In our previously published article, we listed commonly used IC. There are some worldwide popular circuits with IC and our target is publishing some of them to Help the Arduino users to understand electronics in-depth. Blink is popular initial program in Arduino. Like Arduino, You Can Blink LED With 555 IC. In old days, instead of blinking LED, it was common to refer the phenomenon as flashing LED. How to blink LED with 555 IC is essentially a project for the beginners and is intended to make the Arduino users understand the basic principles and working of one popular IC. There is a dot on 555 IC’s surface pointing the closest pin’s number as 1. Pin 3 is the output pin which generates an oscillation. The voltage goes high — low — high — low and that is called astable mode. There is not many more things to write just for the practical part. This Article Has Been Shared 184 Times! 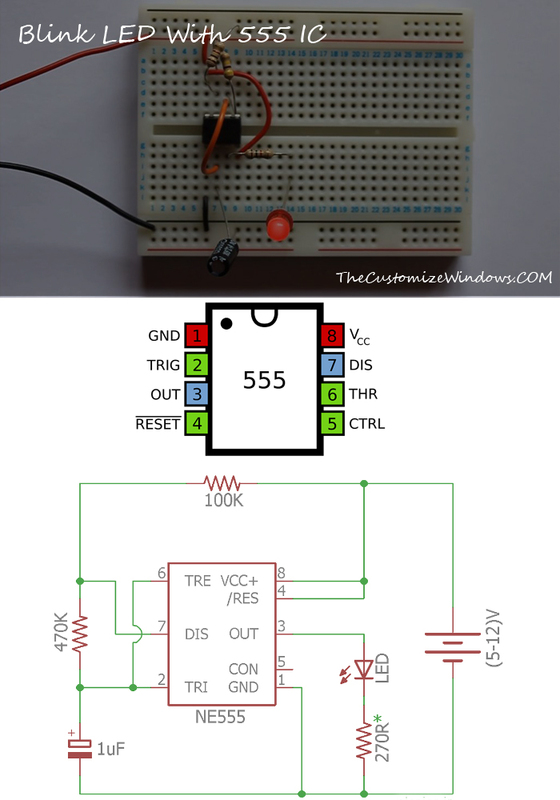 Cite this article as: Abhishek Ghosh, "Blink LED With 555 IC (Classic IC Circuit Diagram I)," in The Customize Windows, July 2, 2018, April 25, 2019, https://thecustomizewindows.com/2018/07/blink-led-with-555-ic-classic-ic-circuit-diagram-i/.